On March 11, 2011, I awoke to stories about an earthquake and tsunami in Japan. My heart goes out to all who suffered loss in that epic event. 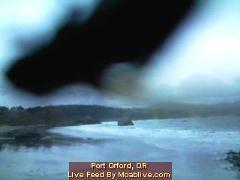 By 8:30 AM PST, I was online and watching our live webcam at the PortOrford.biz website. 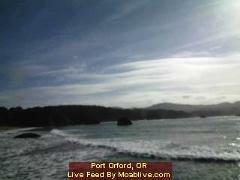 The webcam that we share with Port Orford Property Management faces east on to the beach from the Port of Port Orford. I did not have to wait long before the water surged around the Port Orford Heads and into the Port. Over the next ninety minutes I counted at least five surges, most of which rose to cover the entire beach. In order to capture the moment, I copied a series of JPG images from the webcam. Since the camera uploads a shot every three seconds, there was plenty of action to record. After saving the images, I compiled them in WMV file format. The generic term for such a file is a "wave movie". After uploading the video to YouTube, I embedded it here on my blog. Luckily, there was no apparent damage at Port Orford, although Coos Bay to the North and Brookings Harbor to the south did not fare as well. After all of the excitement was over, we developed a bug in the webcam. In this case, it was a real bug that walked in front of the lens and stayed there until the webcam shut off for the night.